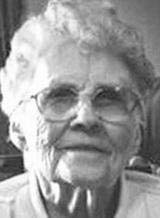 CEDAR FALLS - Mildred C. Banks, 92, of Cedar Falls, died Sunday, April 22, 2012 at Grundy Center Care Center. She was born Nov. 11, 1919, in Pomeroy, daughter of Harry E. and Edna Stenberg Mefferd. She married Oliver J. Banks on June 16, 1940, in Pomeroy. He died July 20, 1985. Mrs. Banks received her two-year teaching degree from the Iowa Normal School (now UNI) and worked at Lee Hardware, Willoughby's Dry Goods and later the Western Home Communities. Survived by three sons, Oliver (Barbara) of Bettendorf, Harry (Lynette) of Grundy Center and William (Laura) Banks of Chesterfield, Mich.; 12 grandchildren; and eight great-grandchildren. Preceded in death by a brother, Robert Mefferd. Memorial services: 1:30 p.m. Saturday at the Western Home Communities Chapel, with inurnment in Cedar Valley Memorial Gardens. Richardson Funeral Home is in charge of arrangements.